It’s been nine years since my last interview with Tony Nominee Xanthe Elbrick. 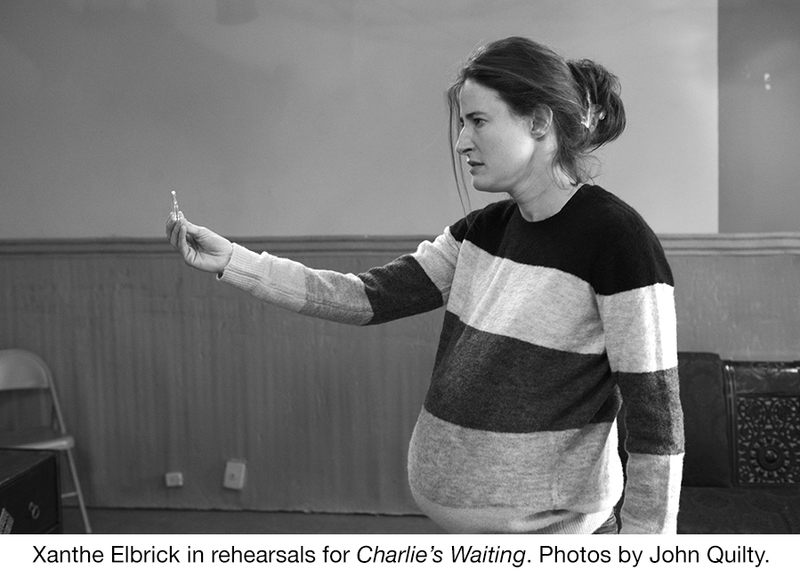 It’s great to now catch up with her as Xanthe gears up to star in Parity Production’s latest show Charlie’s Waiting. Charlie’s Waiting, a world premiere by 2017 Parity Commission winner Mêlisa Annis, follows two women the night before their wedding. A pregnant “Louise” (Xanthe Elbrick) is busy with all the planning while her fiancée “Kelly” (Stephanie Heitman) busies herself feeding the goats. Everything is going to plan, that is until “Louise” is forced to confront questions of trust and intimacy, and she discovers how quickly plans can get derailed. Charlie’s Waiting plays at Theaterlab (357 West 36th Street, 3rd floor) through April 20. Click here for tickets! For more on Xanthe visit https://www.xantheelbrickphotography.com and follow her on Instagram! For more on Parity Productions visit https://www.parityproductions.org and follow them on Facebook, Twitter, and Instagram! 1. It's been nine years since our first interview together. It's great to catch up with you! What would you say has been the biggest change for you over these past seven or eight years? Wonderful to reconnect with you after all this time, Adam! 2. Now, you are about to star in the world premiere play Charlie's Waiting, by playwright Mêlisa Annis. What made you want to audition for this show? I was very lucky that I didn’t have to audition for CHARLIE’S WAITING. The director called to offer me the role of “Louise” - I love Mêlisa Annis’ work and so jumped at the chance to play the lead in this brilliant dark comedy. 3. What do you relate to most about your character, "Louise"? I grew up in a tiny village in the middle of the english countryside, 21 people total. CHARLIE’S WAITING is set in just as rural an environment- if not more so. It feels just like home. 4. What is one characteristic of hers that you are glad you yourself do not possess? Interesting question - In judging “Louise,” I would be challenged to do her justice; As an actor I have to love and believe in all of “Louise’s” choices in order to make them my own. I suppose her ability to sweep things under the rug...I’m glad I don’t have a desire to do that with problems that come along but prefer to deal head on with whatever comes my way. 5. During the show, "Louise," discovers how quickly plans get derailed. When has there been a time when you've had plans that got derailed? To be honest, I live day to day and focus on being the moment, not much of a planner...after all “make plans, and God laughs,” right? 6. Did you stay off-course or did you get back on track? If you stayed off-course, what did the new direction show you? If you got back on track, how did you get back? Love going off course: that’s when I learn the most. I think a new direction shows me that I can grow in ways I never imagined. That’s the fun of life. 7. What do you feel audiences should know about this play before attending? That they might want to use the restroom before the show as there is no intermission. 8. When you are not acting, you are busy capturing happy moments in people's lives as a photographer. What do you get from photography that you don't get from acting? I get to really listen and learn from my clients’ amazing stories. 9. With all the pictures you've taken, what picture perfect moment have you captured that you still hope to have in your own life? Dogs, and their happy wagging tails. Favorite go to Emoji when texting? Broadway: Coram Boy (Tony Award, Drama Desk Nom, Theatre World Award Winner) Off-Broadway: Candida (Drama Desk Award), Beebo Brinker Chronicles, Leaves of Glass, The Alice Complex, Peter And The Starcatcher (original workshop cast). Sith Inquisitor: STAR WARS The Old Republic, Body Of Lies (dir. Ridley Scott), Igraine The Brave (Parents’ Choice Award). Trained Royal Academy Of Dramatic Art, Actors Studio MFA.